Which is more fearsome: the Yellowjacket's sting, or the Tiger's roar? It's a close call. Ties between RIT and its older crosstown neighbor, University of Rochester (UR), have grown closer over the years. Since RIT became a nationally-ranked research university, RIT and UR have even collaborated on PhD research programs. 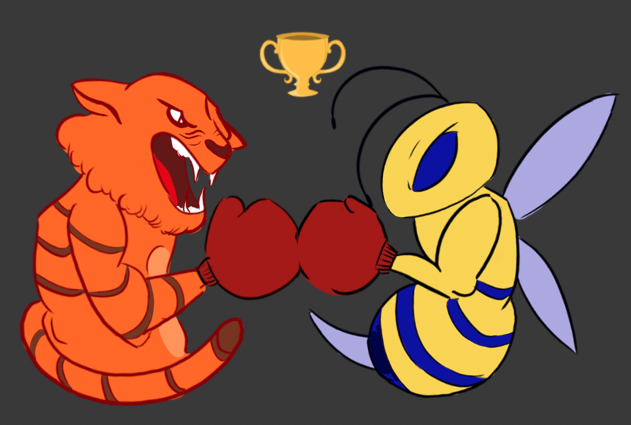 Does this evolving relationship mean the Yellowjackets and the Tigers have lost their competitive spirit on the playfield? Kailan Lee, a first year Business major and point guard for the Yellowjackets men's basketball team, doesn't think so. “I definitely feel like there's some crosstown rivalry in the atmosphere,” Lee said. Louis Spiotti, executive director of Intercollegiate Athletics at RIT, agrees. During the 2016–17 season, the Tigers proved the more effective hunters on the field. RIT went 9–8 with UR in individual school matches. However, the Tigers and Yellowjackets don't always share the same hunting grounds. RIT has no counterpart to UR's squash team, ranked #1 in 2017 in a league which includes the likes of Harvard, Yale and Dartmouth. UR has no answer to RIT's nationally ranked Division 1 hockey team. The sports the schools do have in common often compete in different leagues, too. Both schools are members of the Liberty League, but UR is also a member of the University Athletic Association, an older and more geographically diverse group of schools. “They call that the 'airport league' because they have to fly everywhere,” Spiotti quipped. It's not uncommon for college sports to get personal. Games can turn into points of heated contention between coaches and athletes from opposing schools, especially between rivals. However, Spiotti says there's no ill will between Rochester's largest universities. “Sometimes that happens amongst institutions," Spiotti said. "A couple teams don't get along very well, a couple coaches don't get along very well or administration doesn't see eye to eye. Its always been harmonious ... [UR is] a special university, a special school." Still, when UR and RIT do meet on the field, court or the track, the competition is as fierce as any. “We like to beat them. They like to beat us,” Spiotti added. Caleb Ng, a first year New Media Design major and member of the Ultimate Frisbee club team at RIT, can attest to the competitive spirit between the Tigers and Yellowjackets. The team has played UR three times in the 2017–18 academic year, and have not yielded any easy victories. “We'll see them at tournaments ... whenever we play them they always pull out a specifically annoying defense,” Ng said. Lee must have had a different experience when UR's basketball team faced off against RIT this year. “It'd be nice to continue to have the opportunity to play you guys and other local schools and get to know each other on and off the court because we are so close, you know?” Lee said. Despite the friendly nature of the schools' competition, there's one area Louis Spiotti will vouch for RIT's superiority all the way: school spirit. “I think they have their own energy around certain sports. But there's nothing that comes close to hockey. They have nothing like that. To get two or three thousand fans or to get 11,000 down in Blue Cross, that is a spectacle that is the envy of everyone,” Spiotti said. “There's been a lot of energy around hockey more so than any other sport. I think that kind of tone around here separates us a little bit. I think it makes a difference that we have this D1 sport." RIT's men's hockey team has repeatedly won the Atlantic Hockey Tournament and even made it to the NCAA Frozen Four in 2010. The women's team is now also D1 after winning the D3 NCAA championship in 2012. By contrast, UR's flagship sport, football, has faltered in recent years. “They've struggled ... the fall kicks off things in football and it really sets the tone for the year,” Spiotti commented. In contrast, enthusiastic tiger fans flock to RIT's stadiums in the thousands all through the winter. Dan is a fourth-year Industrial Design major and the Features Section editor.